September 12th is one of the best and most joyous holidays on the calendar. 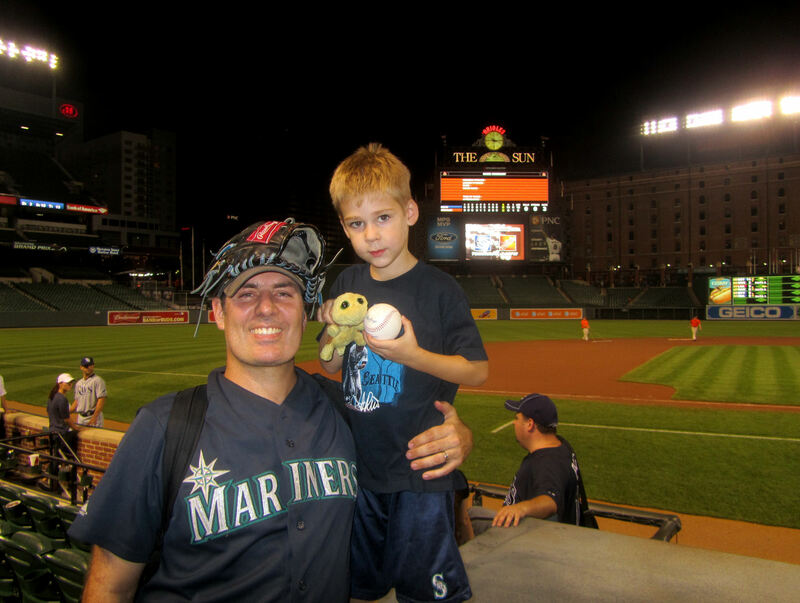 The holiday dates back to 2006 and marks a wonderful occasion – Tim’s in-person introduction to Major League Baseball and our Seattle Mariners. This is the story of Tim’s Sixth MLB Anniversary! A little background is in order before we jump into the day’s events. 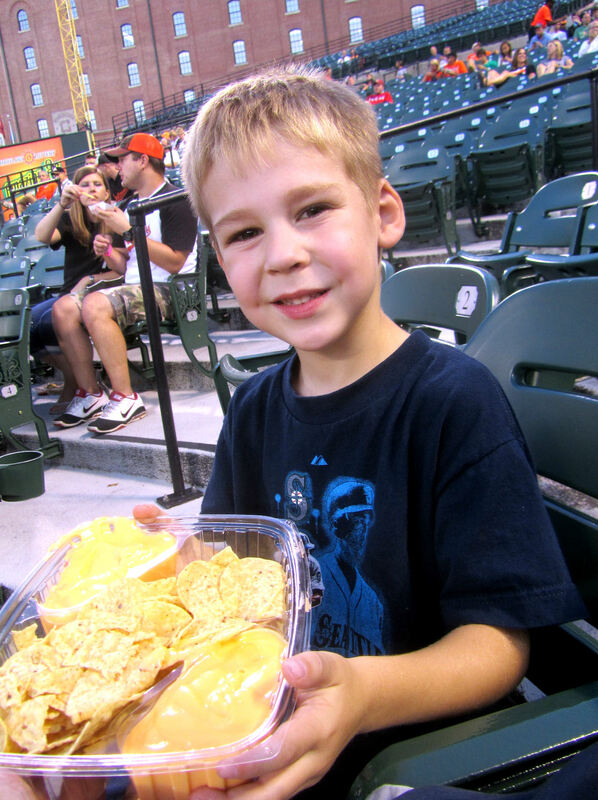 On September 12, 2006, we celebrated Tim’s first MLB game. It was a wonderful Mariners victory over the Toronto Blue Jays. On September 12, 2007, by total dumb luck, we ended up at Citizens Bank Park to witness the Colorado Rockies absolutely wallop the Philadelphia Phillies 10-0. 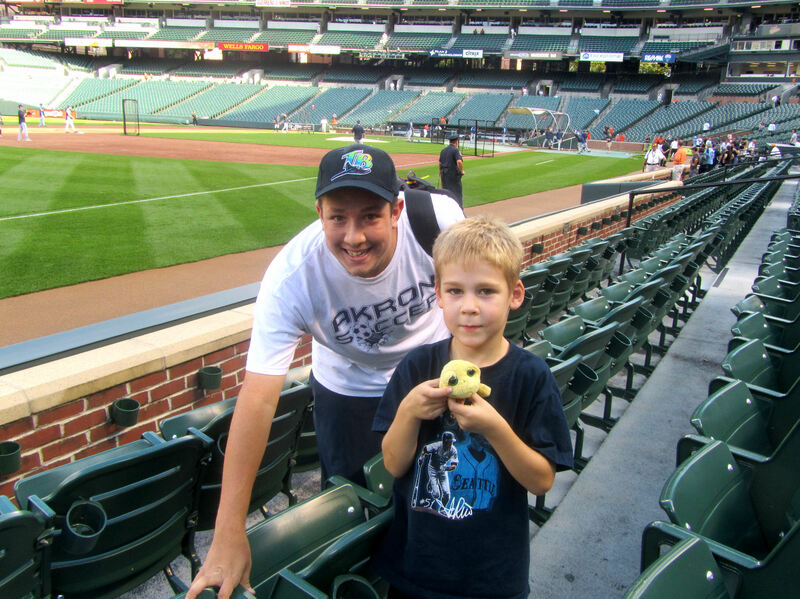 When I realized during the game that it was the first anniversary of Tim’s MLB debut, I decided right then and there that I would make every effort within my control to take Tim to a Major League Baseball game on September 12th every single year. And every single year since 2006, September 12th has been an awesome day for us. 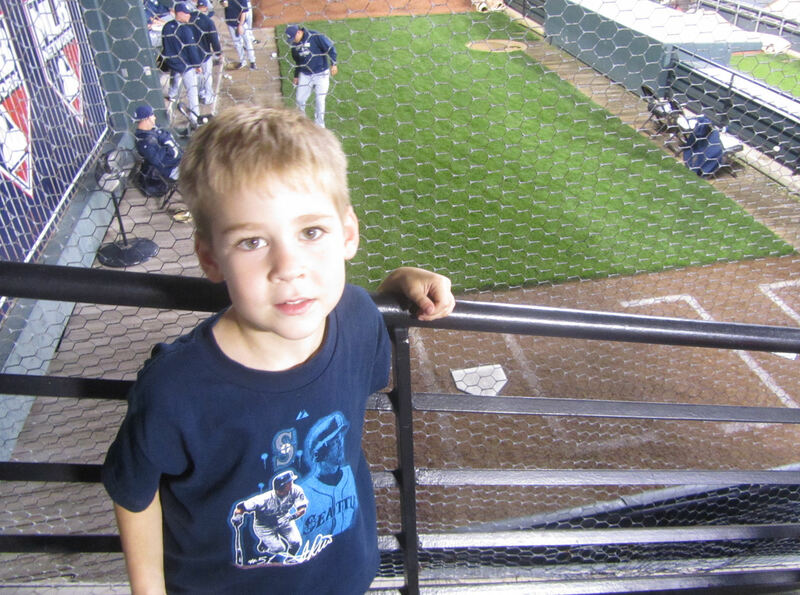 On September 12, 2008, we visited Arizona with my folks and saw Brandon Webb win his 20th game of the season over the visiting Cincinnati Reds. 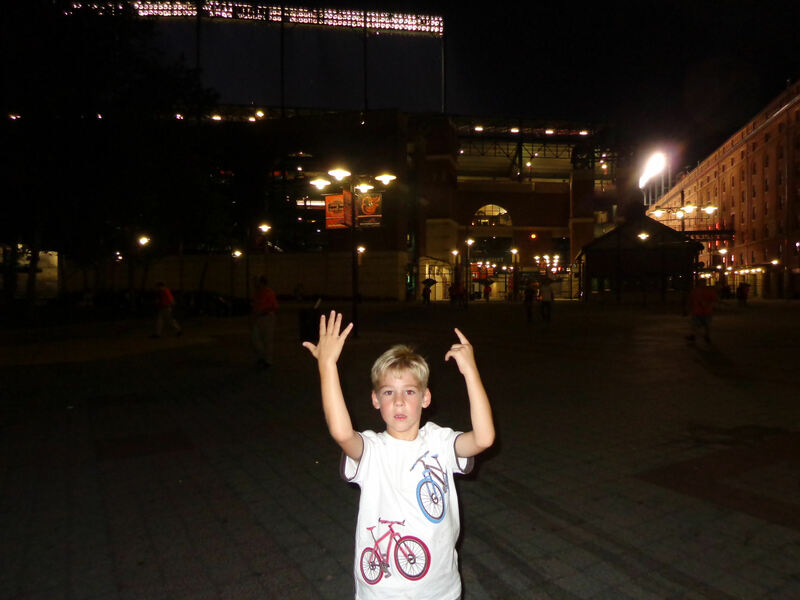 On September 12, 2009, we were thrilled to see the Orioles beat the Yankees in New York. 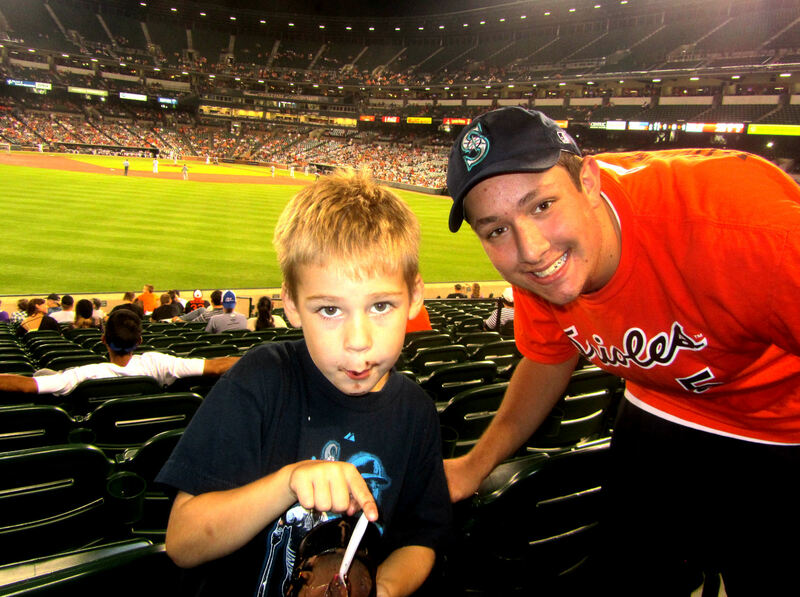 On September 12, 2010, we were in Washington, D.C. to watch the Marlins beat the home team Washington Nationals with Tim’s Poppy. 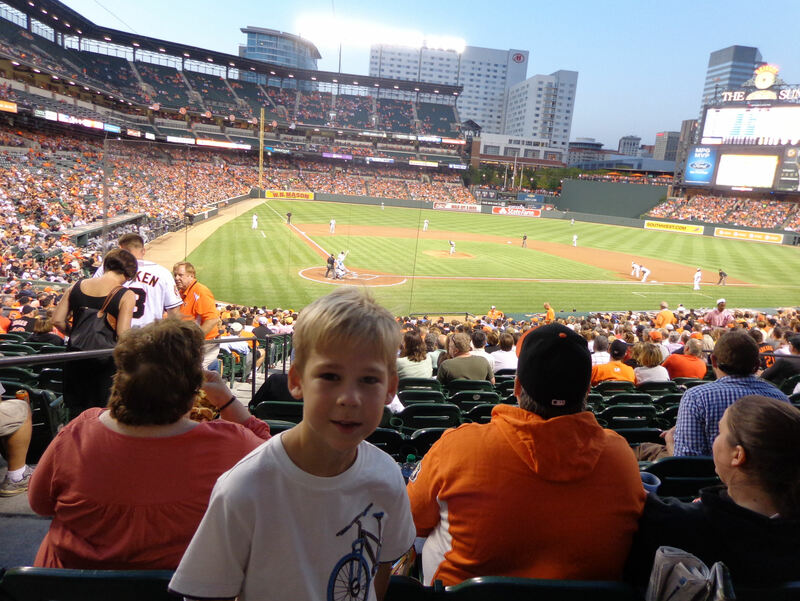 On September 12, 2011, we headed down to Baltimore and had a great time watching the Tampa Bay Rays beat the Baltimore Orioles. I originally had a couple additional goals for Tim’s MLB Anniversary that have fallen by the wayside over the last couple seasons. First, I wanted to see two different teams play every season on September 12 (i.e., no repeat teams) until we could see the Mariners play again on Tim’s MLB Anniversary. Along the same lines, I wanted to visit a different stadium every year on Tim’s MLB Anniversary, at least until we could make it back to Safeco Field for another anniversary game. 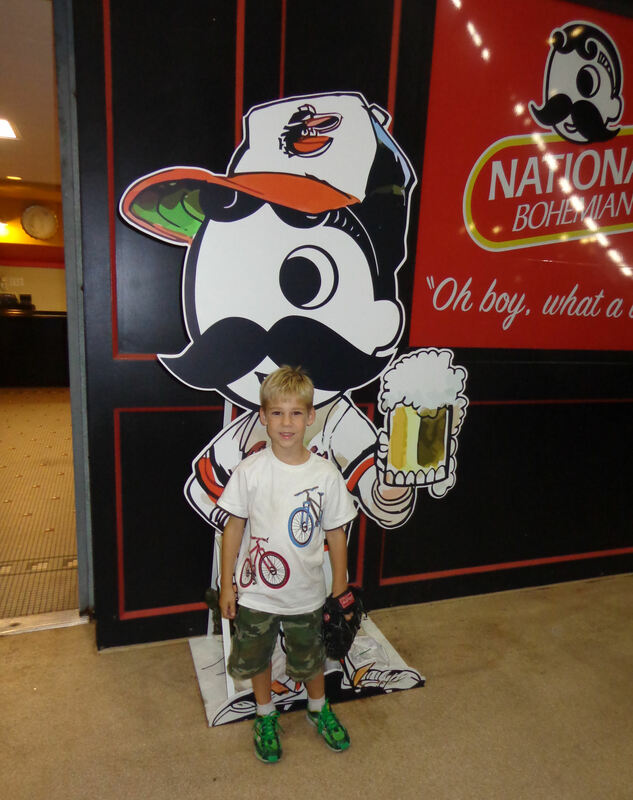 Last season, our no-repeat-teams goal fell apart when we saw our second MLB Anniversary game featuring the Baltimore Orioles. This year, our no-repeat-stadiums goal was thrown on the scrap heap, too. Planning was very difficult this year. September 12 was a Wednesday. I originally wanted to head up to Toronto to see the Mariners in a rematch of Tim’s MLB Debut game. But that wasn’t going to work for a mid-week game. Our second plan was to head to Queens to see the Mets take on the visiting Nationals. That game would have preserved our no-repeat-stadiums goal and it was our plan for a long time. But in July or August, I got news that I had a very important business appointment scheduled for the early afternoon on September 12th in Philadelphia. 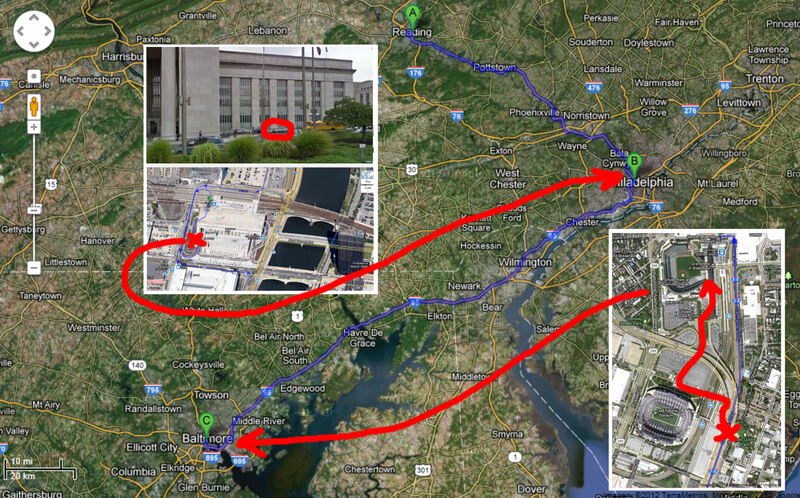 With traffic, we live about 1.5 hours from Philadelphia. Tim would be in school until 3:10. Going to NY was out of the question. Next, I thought about the Phillies…but their game was scheduled to start at 4 p.m. That was a no go, as well. 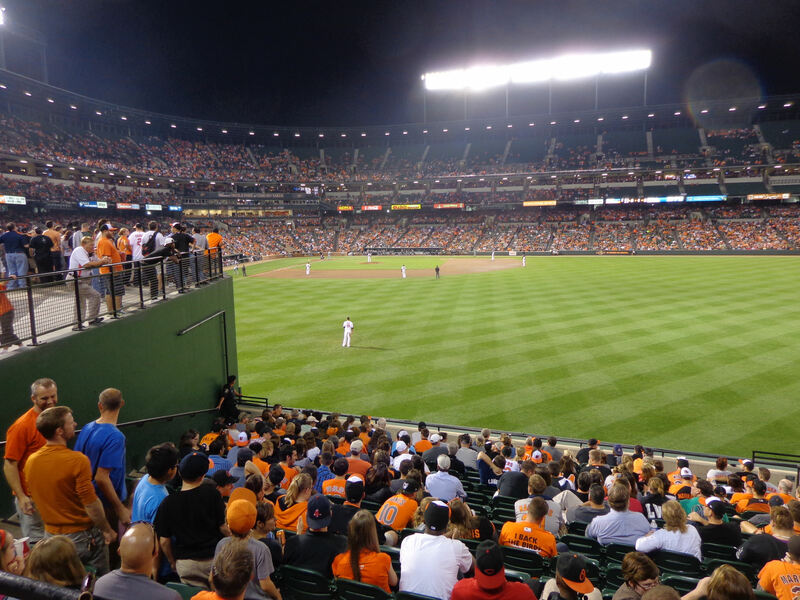 So, I looked back to Baltimore, site of Tim’s Fifth MLB Anniversary, and found that the Orioles would be playing the Rays on September 12, 2012 at 7:05 p.m. It was an exact rematch of last season’s MLB Anniversary game. It would obliterate all of our secondary stadium/teams goals. But with a little help from Colleen, I figured we should be able to make it to the game, and that was the only goal that really mattered. BP would be out of the question. But at least we should be able to make it for the game. So that was the plan. 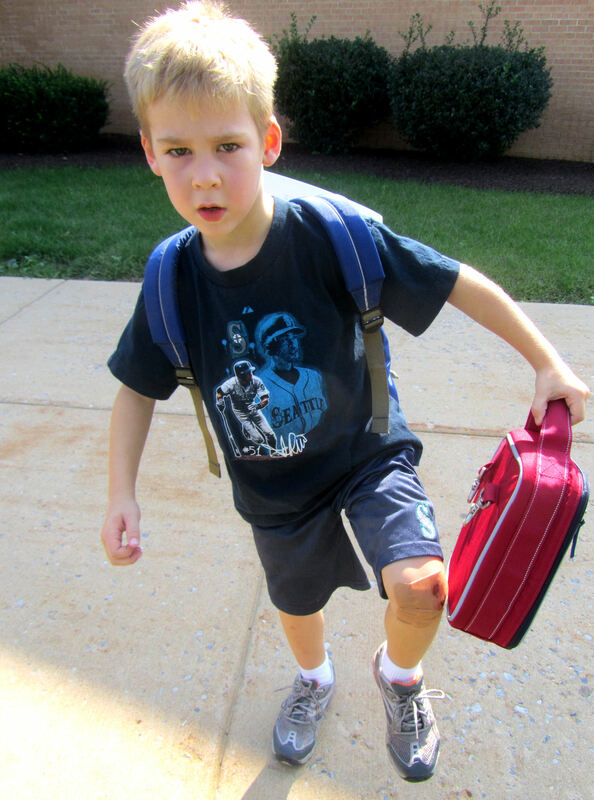 Colleen and Kellan picked Tim up from school at 3:10 and immediately hopped on the road down to Philadelphia. I was detained until around 4:30. When I freed up, I called Colleen to find they were still stuck in traffic. I hopped in my car and drove across Center City Philadelphia. Colleen and the boys reached Philadelphia while I was still stuck in traffic. I met up with Colleen and the boys at 30th Street Station in West Philadelphia. The boys then hopped into my car and we hit I-95 South toward Baltimore. 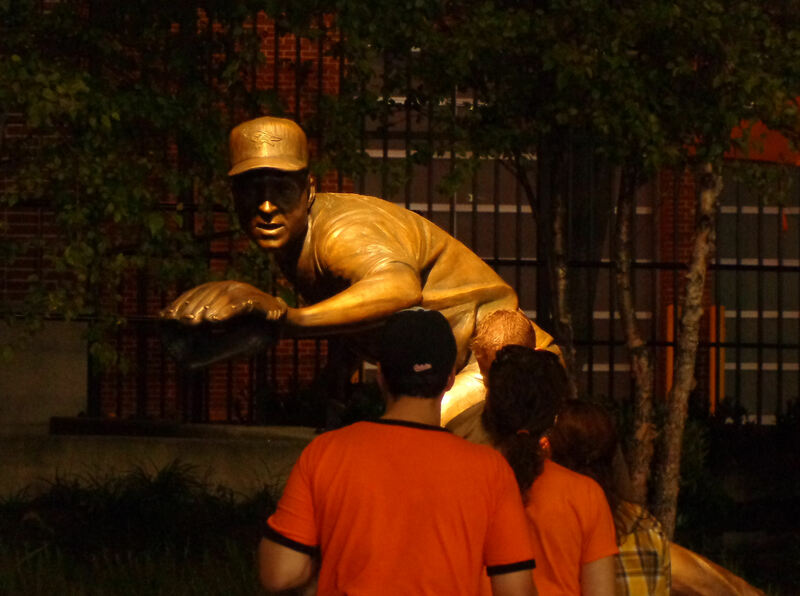 My GPS told me we were going to arrive at Camden Yards around 6:30. But traffic crawled coming out of Philadelphia. We broke out of the traffic around the Delaware state line. By that time, my GPS said we would arrive at the stadium around 7:10 – five minutes after game time. Traffic was non-existent in Delaware and Maryland and we picked up a few minutes. 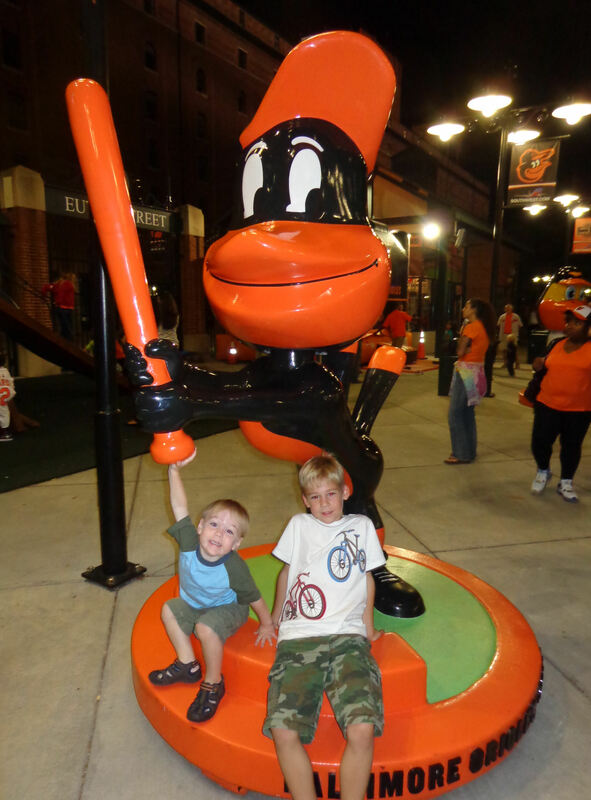 After the boys spent around 4 hours in the car, we arrived at the Camden Yards parking lot right next to the Ravens stadium. Avi Miller purchased our tickets while we were still in the car and very kindly came and met us at the gate to save us some time getting into the ballpark. The game actually started while we were still parking our car and B.J. Upton hit a leadoff homerun to put the Rays up 1-0 while we were walking toward the stadium. So we missed a few batters, whatever, we were at the ballpark for some MLB Anniversary baseball action! So, each of the last two seasons, we had exactly one game per season at which we didn’t get a baseball. 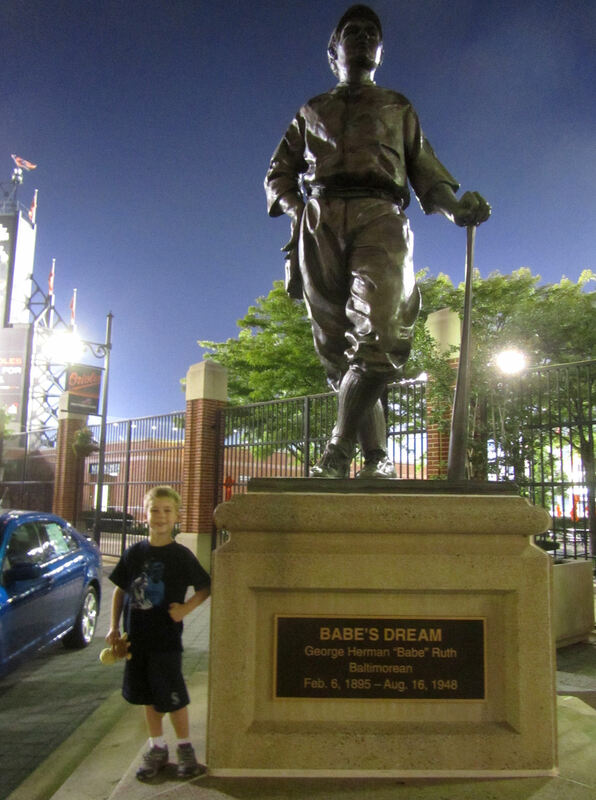 I don’t really worry about having a *streak* of getting a ball at each game – in fact, I have no clue what our current *streak* is – but I’ve had a goal of trying to complete a full-season getting at least one baseball at each game we attend. After this game, we would only have two more games this season. With no BP or other pre-game festivities, this would be our greatest challenge of the season. We had no luck, but the Orioles did. On the strength of singles by Nate McLouth, J.J. Hardy, Matt Wieters and Wilson Betemit, the Orioles scored two runs to take a 2-1 lead in the bottom of the first inning. 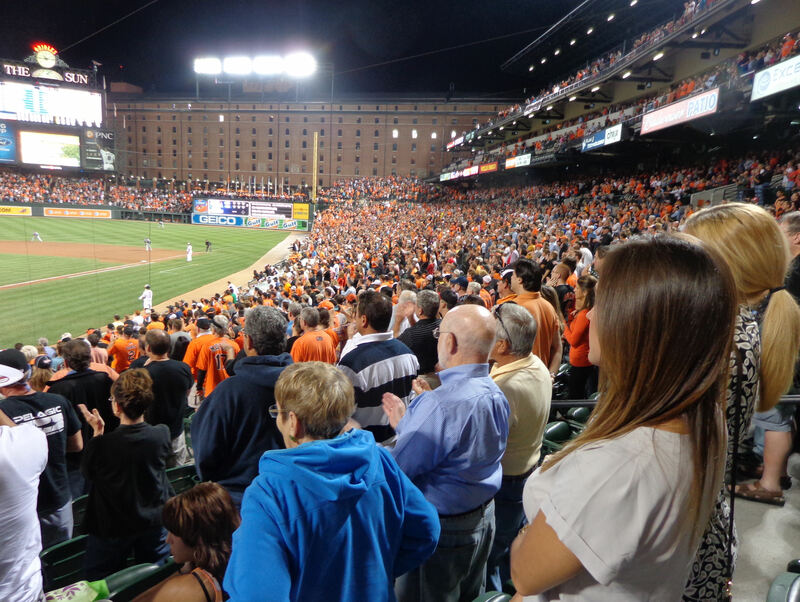 By the way, this was a huge game for the Orioles. They were one game back in the east behind the first place Yankees who were facing the struggling Red Sox in Boston. After the end of the first, we decided to head down the 1B line cross-aisle to say hi to Avi, and then go grab some pizza. While we were chatting with Avi, Carlos Pena led off the top of the second inning and smacked a foul ball directly to where Tim is standing in that last picture! Aye…we would have had a great shot of catching it had we stayed put. 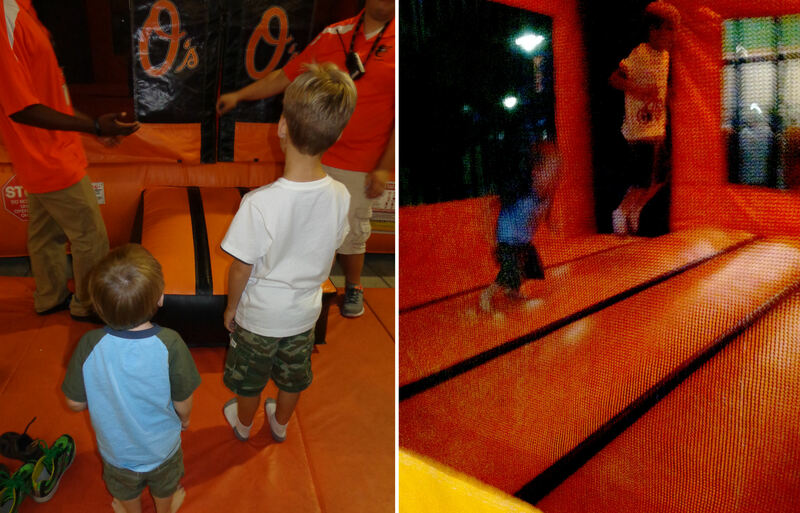 The new bouncy house this season is great, except for one pesky thing. It is bigger and better for the kids. But the old bouncy house had a big loosely-knit net wall on one side that was great for taking pictures of the kids bouncing inside. The new one has a tight-knit net on all sides and it is impossible to get a good action shot of the boys bouncing inside. After playing in the play area, we planned to get ice cream helmets. There is an ice cream stand in the concourse down the 3B line. I figured we would get some helmets there and then head back to the bullpen area to eat ‘em. 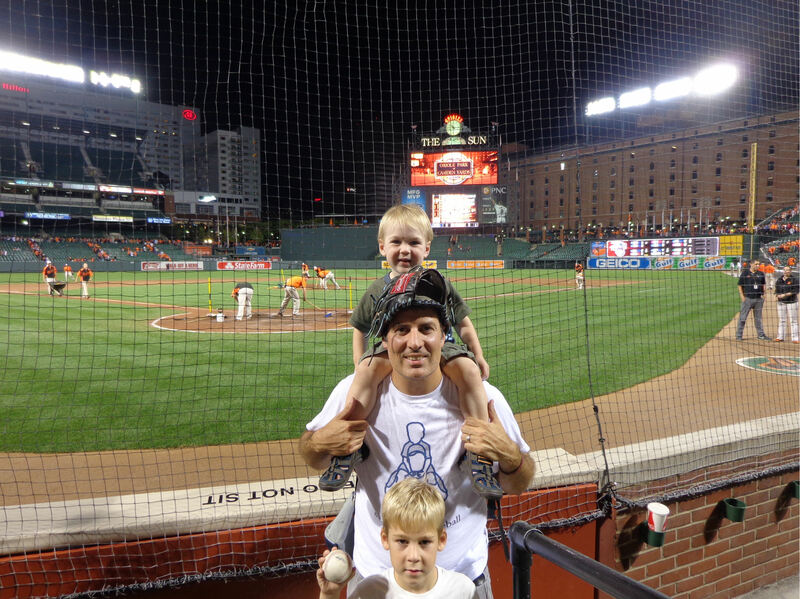 But as we passed behind home plate, we ran into our friend and Camden Yards regular Matt Hersl. When I mentioned that we were on our way to grab some ice cream, he reached into his backpack and pulled out two little cups of carvel ice cream and handed them over. That was pretty odd…, but, hey, thanks, Matt! I’ve gotten ahead of myself here. 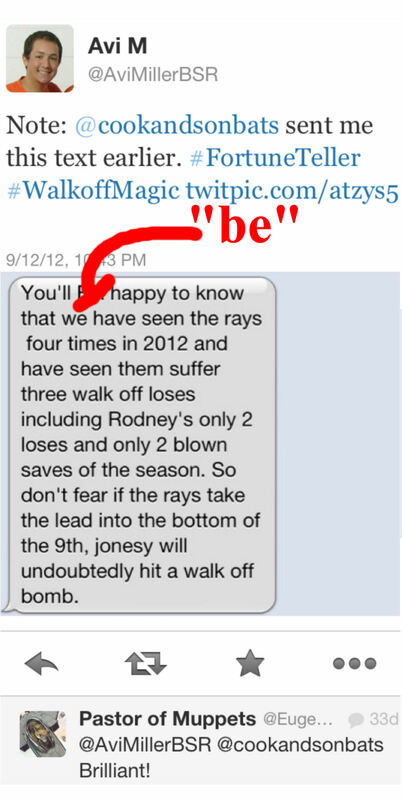 I should mention that the Rays scored a second run in the bottom of the third. For most of this game, the score was tied 2-2. Alex Cobb had started the game for the Rays and pitched 4.2 innings. After Cobb, the Rays cycled in a new pitcher pretty much each inning. Jake McGee in the fifth-sixth, Wade Davis in the seventh, and Joel Peralta in the eighth. Well, that’s not completely accurate. Cursi didn’t’ catch each of the pitchers. Some of them he just watched and consulted with another Rays catcher. Anyway, the game was still tied 2-2 in the top of the ninth. The Orioles brought in closer Jim Johnson. 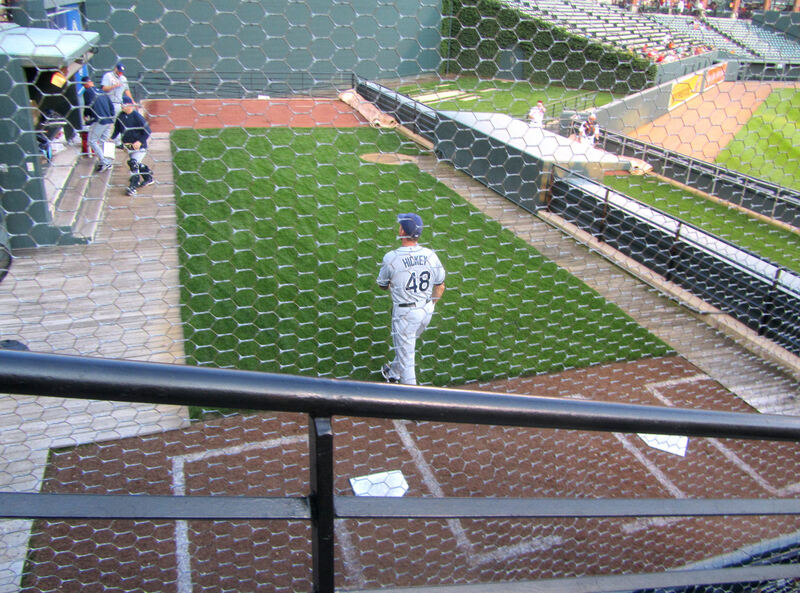 Meanwhile, Cursi was warming up Kyle Farnsworth in the Rays’ bullpen. Johnson had a rough inning. After retiring the first batter, he gave up a single to Jeff Keppinger. Joe Madden sent Rich Thompson in to pinch-run for Keppinger. After Ben Zobrist flew out to CF, Thompson stole second. 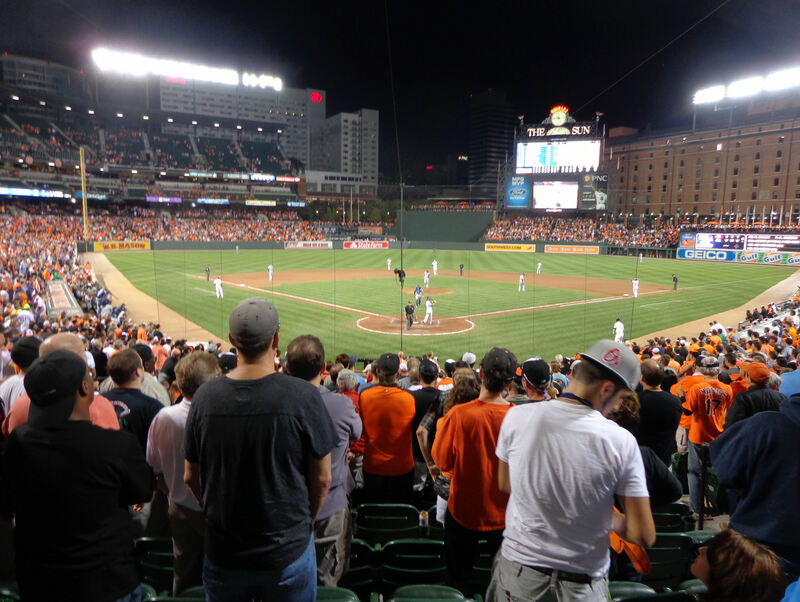 Around this time, I realized that once we made it to the bottom of the ninth, the Orioles could win it on one swing with a walk off homerun. So I decided we would head to home plate once the game moved to the bottom of the ninth to see if we could get into position to go for an umpire baseball. With two outs, Evan Longoria then hit a soft grounder down the 3B line that was ruled an infield hit. As Thompson broke hard for third, Manny Machado charged the ball hard, scooped it up in his bare hand and made a hard fake throw toward first. Thompson bit on Machado’s fake throw and rounded third hard. Machado instantly spun and threw behind Thompson to Orioles short stop J.J. Hardy. One throw later, Matt Wieters tagged out Thompson as he headed back toward 3B. And that ended the top of the ninth inning. I was all set to head toward home plate as Scott Cursi took the final warm up pitch from Kyle Farnsworth. Farnsworth headed toward the CF gate to enter the game and Cursi headed toward the bullpen bench. Before we left to walk toward home, I called out Cursi’s name. He looked up and tossed us Farnsworth’s warm up baseball. We shouted “THANKS!” and then started to turn toward home plate, but Cursi yelled for to us to stop. 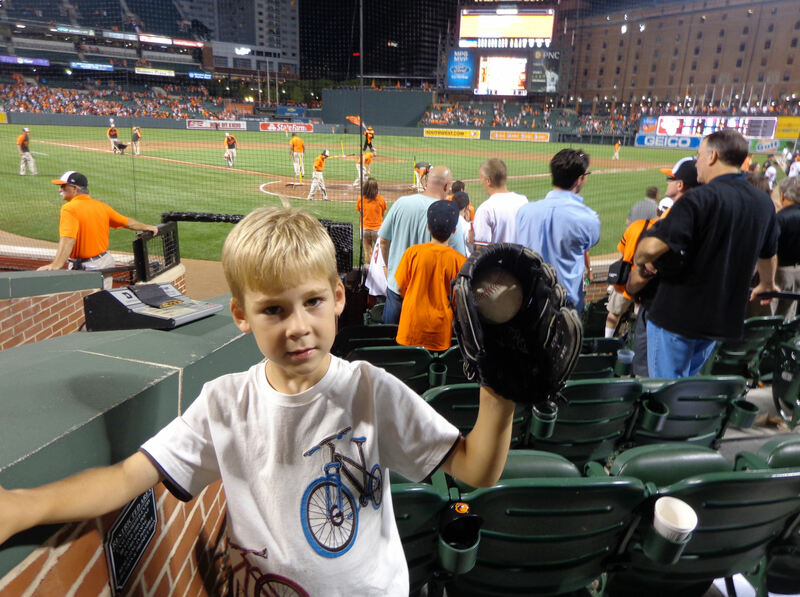 We looked back, and he pulled another baseball (an absolutely pristine Camden Yards 20th Anniversary commemorative baseball) out of his back pocket and tossed it to us too. I must say that Scott Cursi has been amazingly cool to us this season. We saw the Rays play in five games and he tossed us SEVEN baseballs and spent a little time chatting with us in Seattle. 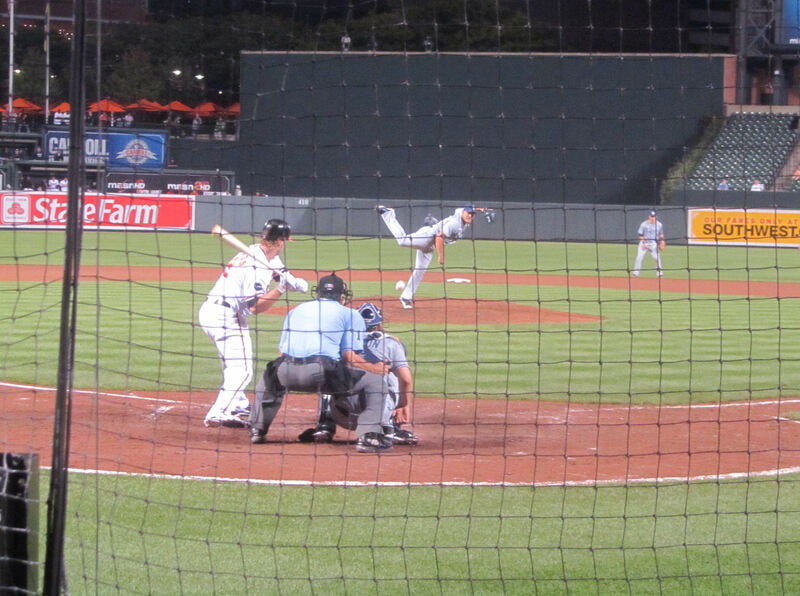 After making the key fake throw to help bring the top of the ninth to a close, Machado led off the bottom of the ninth and smacked a single into LF. He then took second on a sacrifice bunt by Robert Andino. 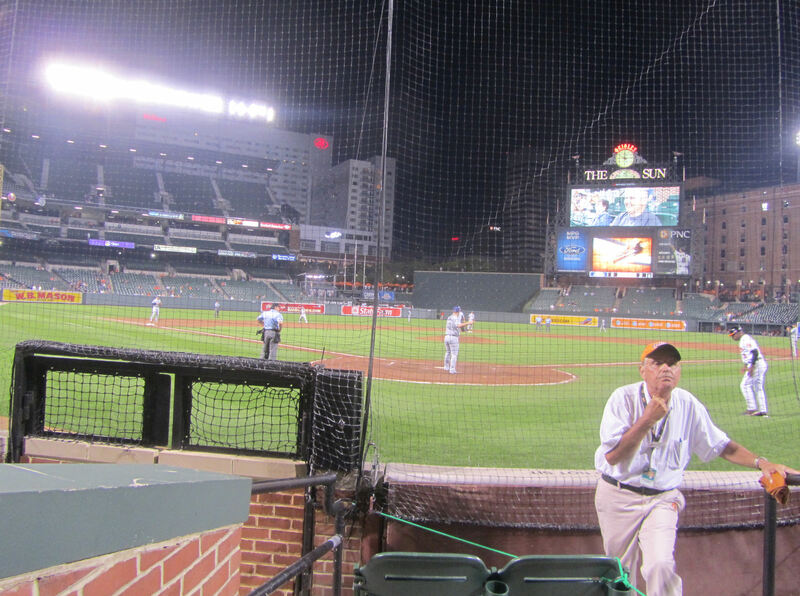 Usually, September crowds at Camden Yards are tiny and lifeless. This year was different. The Yankees had already lost to the Red Sox by this time so they were only half a game ahead of the Orioles. In other words, if Machado could touch home plate the Orioles would pull into a first-place tie with the Yankees. And, I was sort of a fortune teller. 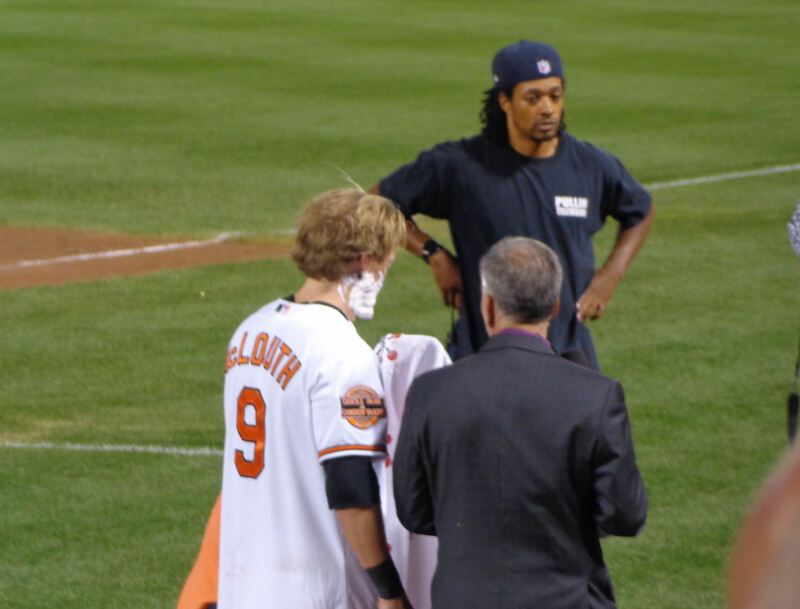 No, Adam Jones didn’t come to the plate in the ninth and the Rays hadn’t taken the lead, but Nate McLouth hit a single to RF for a walk-off win. 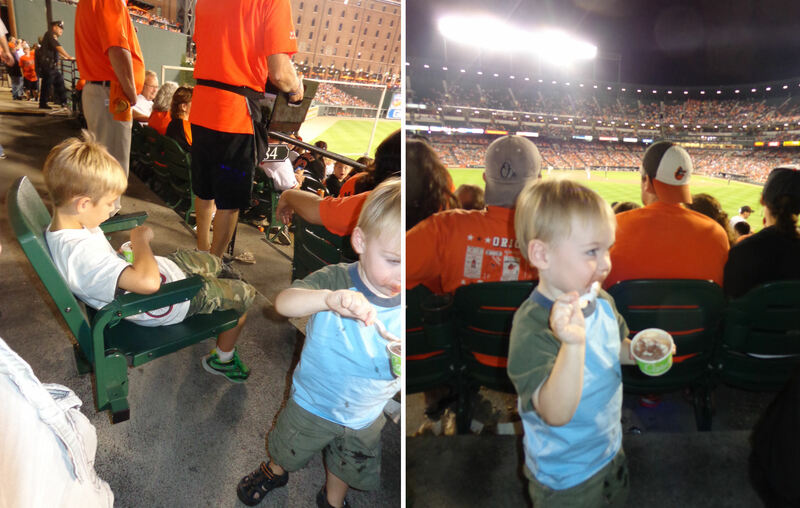 The place was going crazy: Orioles win! 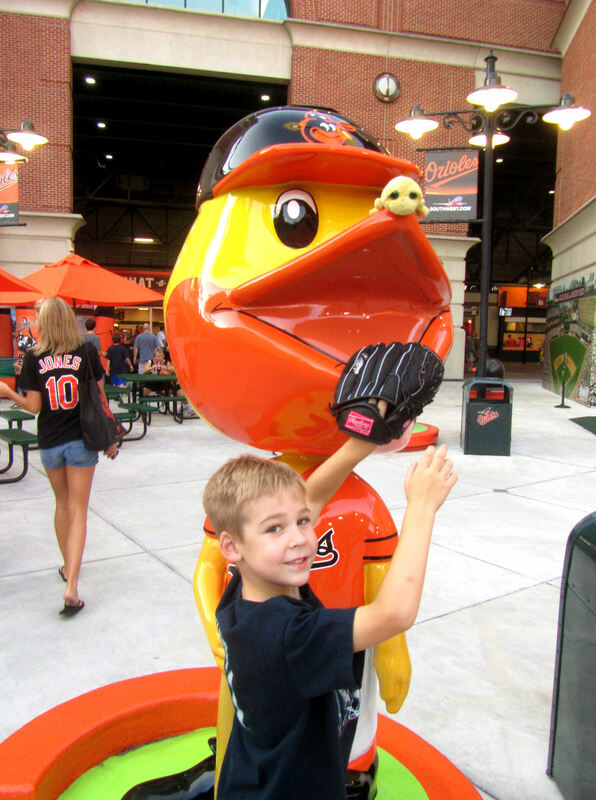 Orioles win! 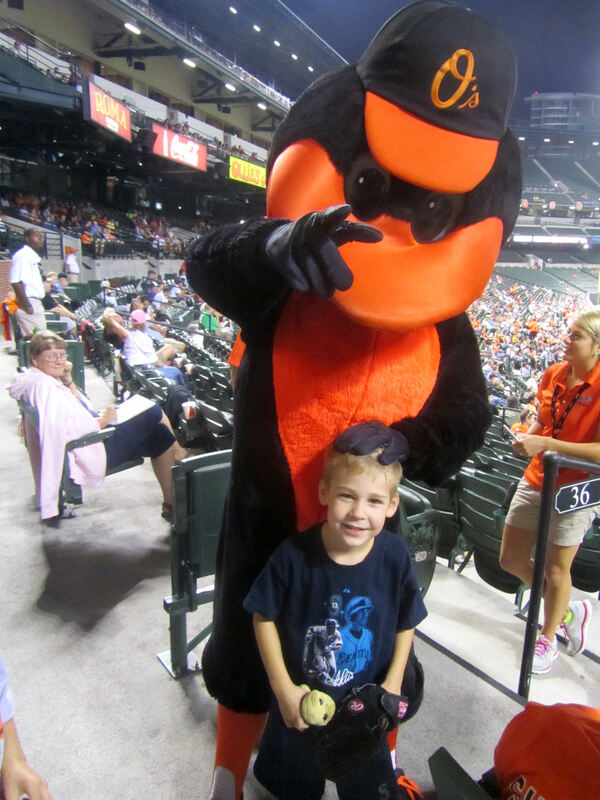 Orioles win! 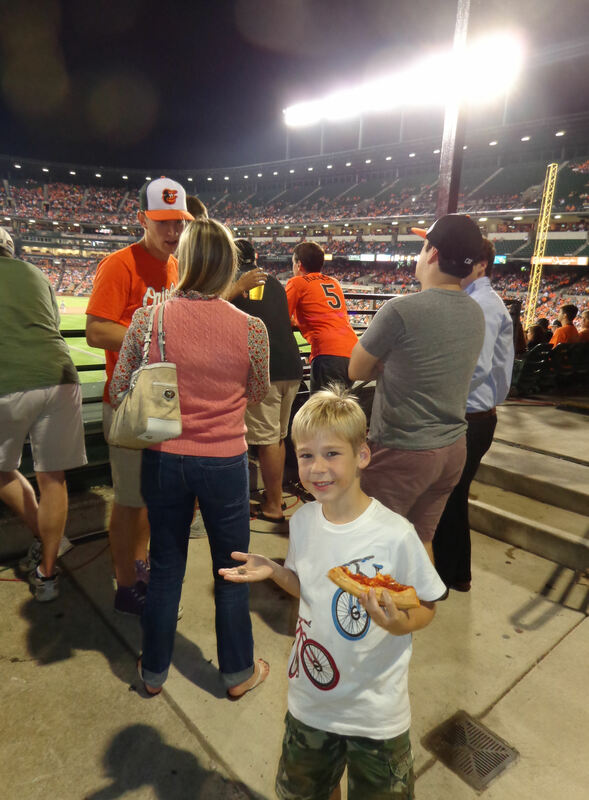 As all of the craziness was going down, Tim, Kellan and I hustled down the stairs toward the umpires’ tunnel where (like Thompson an inning earlier) we got totally faked out by a bit of misdirection. I still have no clue who the first umpire was or why he had two baseballs. I’ve never seen a non-home plate umpire hand out baseballs after a game. Very odd. We have no clue what that guy is all about, but we see him all over the place in Baltimore and he’s a cool looking dude. So, naturally, Tim wanted a picture with him. We had a blast playing catch with Avi after the game. It was the perfect end to another great MLB Anniversary game. This one was difficult from a planning and execution standpoint, but September 12th always delivers great times. I can’t wait to see where September 12th takes us next season for Tim’s Seventh MLB Anniversary! But don’t you worry, things were about to turn around for young Tim. 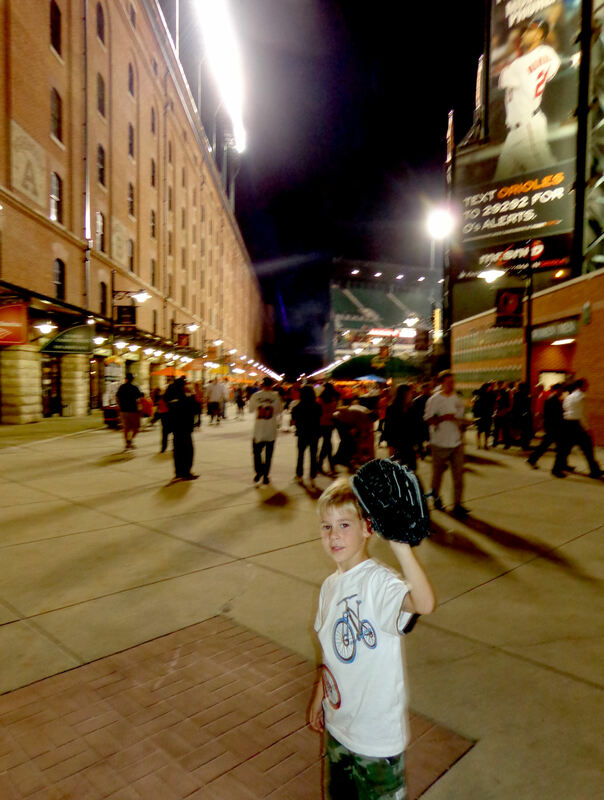 Today was his Fifth MLB Anniversary and we were about to have an awesome evening of baseball at Camden Yards. 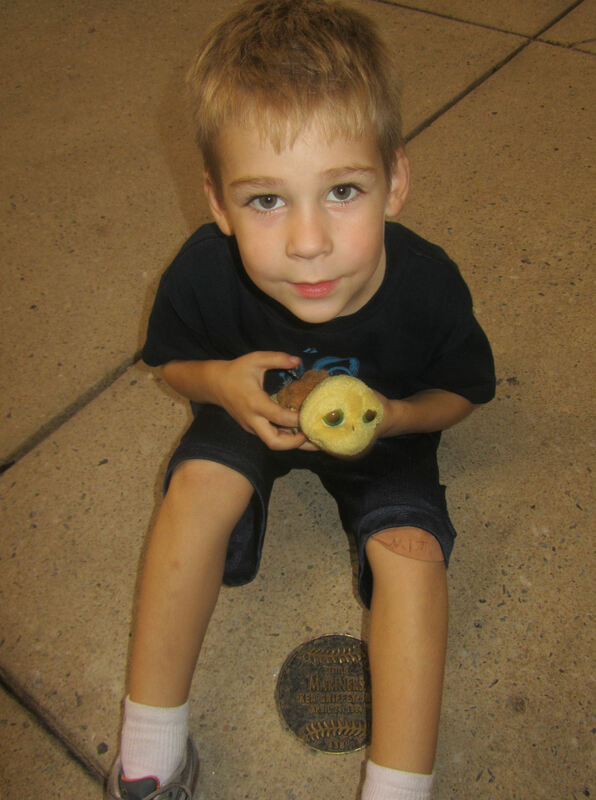 You might have noticed that Tim had a little turtle that he has been bringing to games the last couple months. His name is “Shelly” (yeah, he’s a boy!). Tim got Shelly at the Baltimore Aquarium the day after Kellan’s first birthday and he loves that little turtle like crazy. 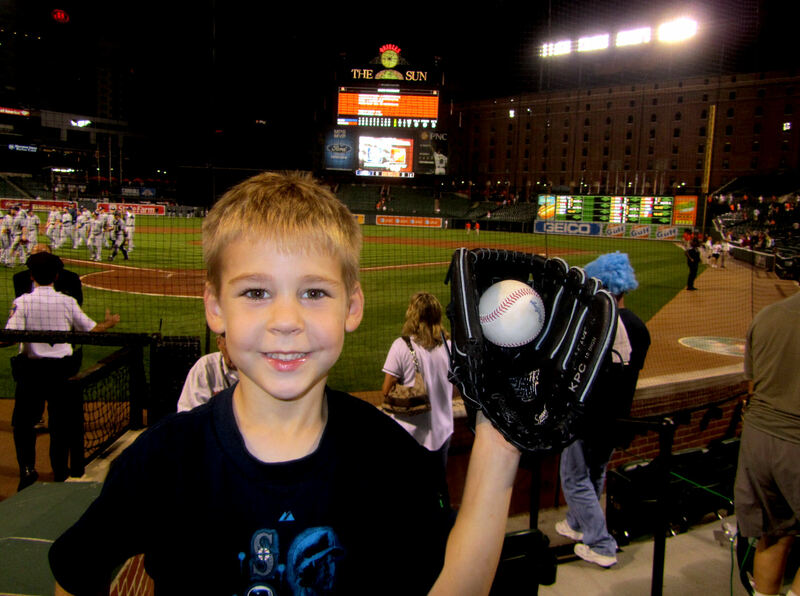 First, he wanted Shelly to get his first baseball at the game. Second, he wanted to get a player to sign the ball for Shelly. I told Tim we’d do our best to achieve these goals. The first goal would not take long. I bought cheap (super cheap) but good (really good) tickets on stubhub, but they were not “season” tickets, and we were running late and arrived after the ballpark opened and Avi Miller was already inside the ballpark. So we were stuck in CF-RF for about 10 minutes upon entering the ballpark. 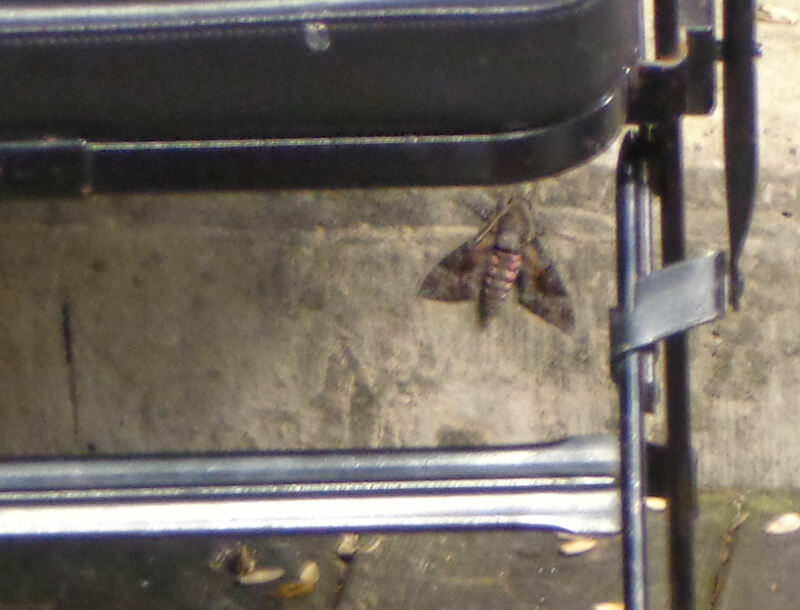 …saw me put on my Mariners jersey. 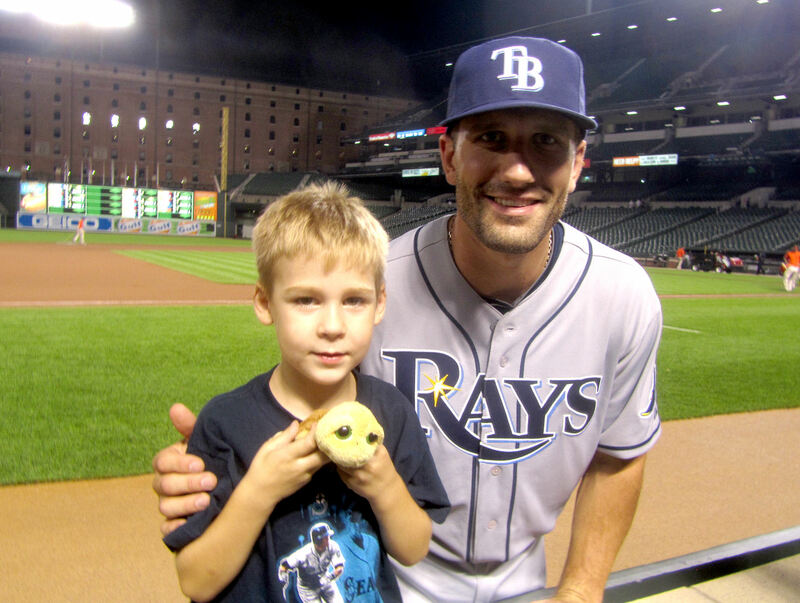 Jak ended up calling to one of his Orioles teammates who had a baseball. 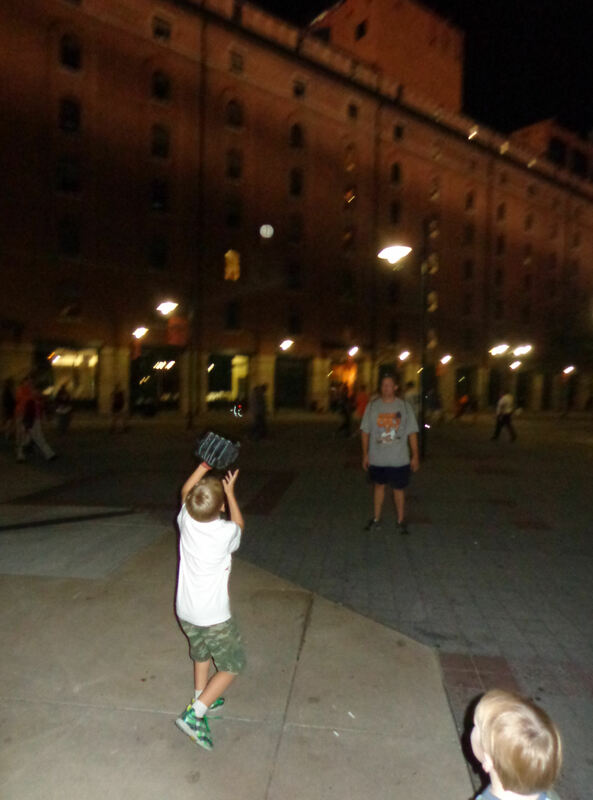 The teammate tossed the ball to Jak and then Jak waved and then tossed the baseball to us. The last couple minutes before the rest of the ballpark opened to non-season ticket holders ticked by ever so slowly. But finally we were permitted to make our way into RF foul territory and around home plate. We were going to head down the foul line toward the LF foul pole. By this time, the Rays were hitting and the Orioles had all exited the field. As we past third base and the infield dirt, the batter hit a soft grounder that rolled to a rest in the grass behind short stop. Rays pitcher J.P. Howell ran over from shallow CF, grabbed the ball, waved to us and made a long throw our way. Orioles Fan Hall of Famer Avi Miller. 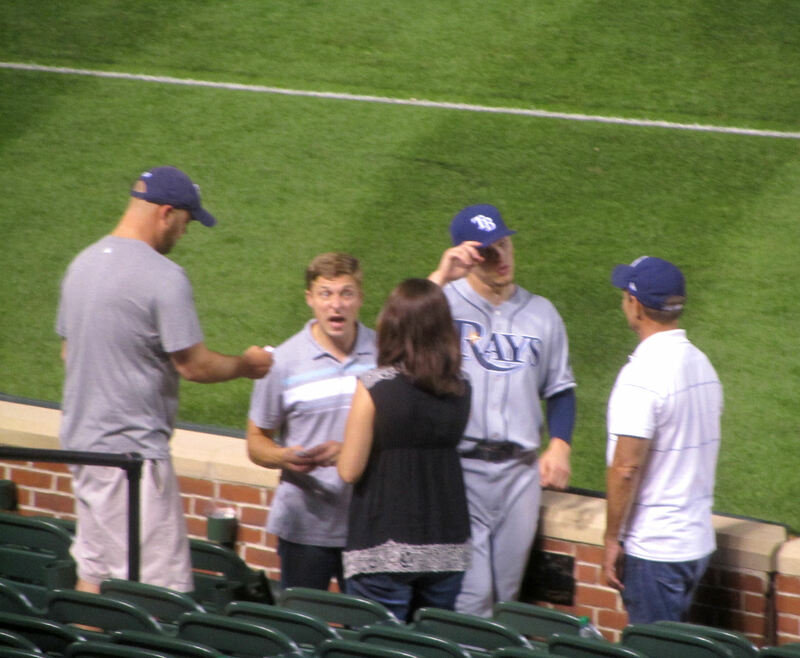 …, Avi announced that he had brought a Mariners hat in honor of Tim’s anniversary. Very kind, Mr. Miller. The three of us walked down the line toward the foul pole and a Rays batter hit a grounder down the line and directly to the on-field usher (Tom) who was standing directly in front of us. Tom grabbed the ball and turned and gave it to Tim. Big thanks, sir! Avi headed back out into left field and Tim and I stayed put. It was an unusually small BP crowd. 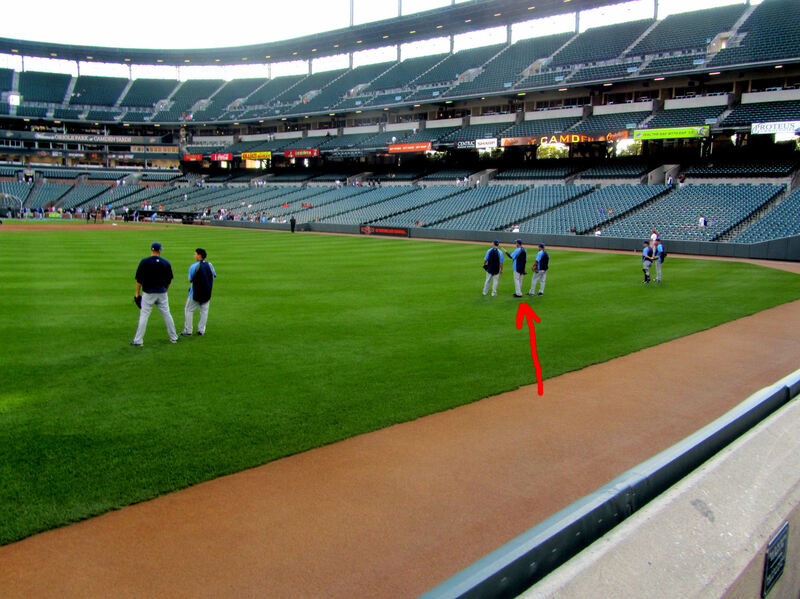 But after hanging out in foul territory for a bit, Tim wanted to head out into LF as well. Cruz looked right at us with a odd (but otherwise indescribable) expression, and then turned and walked away without saying a word. …it was Juan Cruz. I told him that I was pretty sure it was Juan Cruz, but he’d given us a really weird look earlier so maybe I was wrong. Hmm…maybe I’d call him the wrong name? 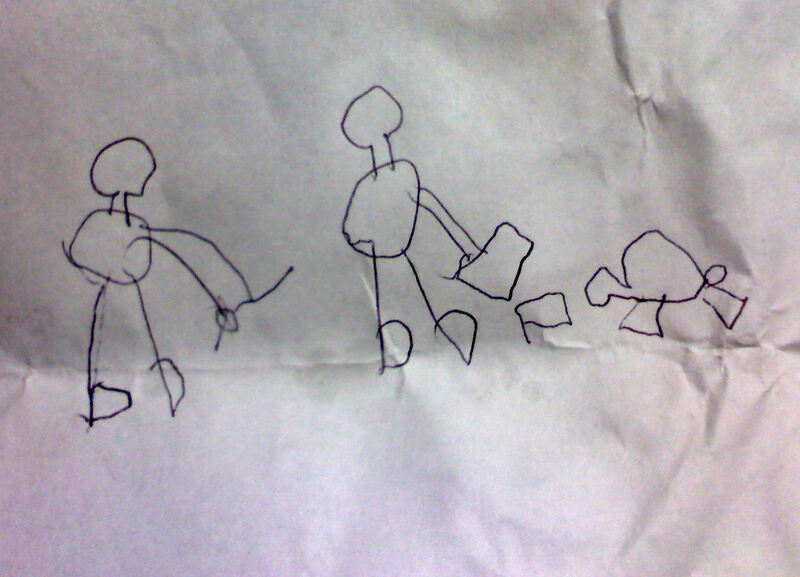 Nah…I looked in our little book where I record all sorts of stuff. Yep, Juan Cruz had tossed us a baseball earlier in the season…and my list confirmed that his name was, indeed, Juan Cruz. Eventually, someone hit a laser line drive homerun directly over our head. I jumped for it and it probably sailed less than a foot over my glove. Ah, ha. Finally, it all made sense — he didn’t want to hit Tim with his throw! And then he threw me a strike. After the baseball from Cruz (already our fourth of the day), the main highlight of the rest of BP was that James Shields made a ridiculously awesome catch, leaping high over the wall in LCF to pick off a would-be BP homerun. other LF regulars, Kelly clearly recognized us. But I was pleasantly surprised when she actually knew Tim’s name! “Wow,” I thought to myself, “If an usher knows us by name, I guess we are officially *quasi-Camden-Yards-regulars!” I like it! After the Rays cleared the field, the extremely small crowd of BP-goers cleared out of LF except for us, Avi and one or two other guys. 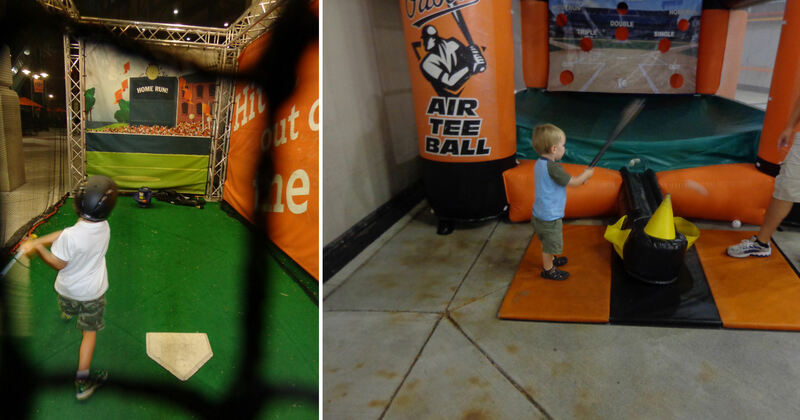 There were tons of BP homers strewn about the ground in the Orioles’ and Rays’ bullpens. After a while the pitchers, catchers, and coaches headed out to the bullpens. Former-Mariners pitching coach and current Orioles pitching coach was kind enough to toss us a baseball from the Orioles bullpen. Adair also noticed our Mariners shirts and stopped to chat a bit. He asked Tim who his favorite player is (Ichiro) and his favorite pitcher (Tim faltered, but then agreed when I suggested Felix Hernandez). I told Adair the story of my mom getting one of the Rick Adair prank t-shirts that Ken Griffey, Jr. had made during spring training in 2010. He got a kick out of that. There were still probably three BP homers laying in the grass. Avi asked Hickey for one and he responded, “You’re too old!” He then turned and weakly tossed a ball in our direction. But it didn’t clear the fence and it bounced down into the stairway that leads from the back of the bullpen down to the bullpen bathrooms. His second toss was on the money. Interesting side note, someone else later tossed the other ball (the one that Hickey failed to get over the fence) to Avi. That was it for our field-area pre-game festivities. We’re typically pretty good at getting 1 or 2 baseballs during BP. But due to the incredibly small BP crowd, we amazingly came away with six baseballs! It was pretty crazy. Aside from a game in 2010 when we got 10 baseballs (including 7 easter eggs), we had never gotten more than 7 at a single game. 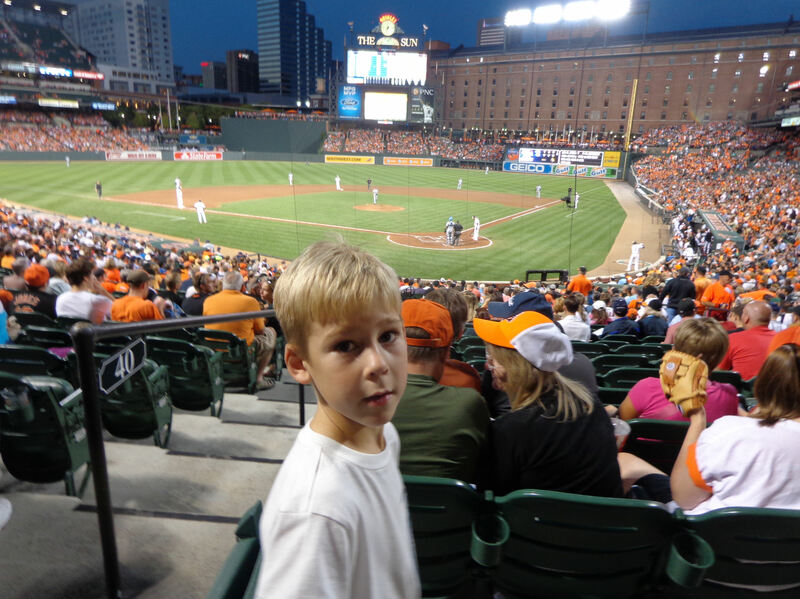 Interestingly, we had come into this game sitting on 191 baseball since Tim’s first game. Coming into the game, I did not even consider the possibility that we would have a chance to approach the 200-plateau at this game. But with six baseballs in our backpack, I began to wonder. I jokingly told Avi that *all we needed* was to get 3 baseballs during the game to hit 200. 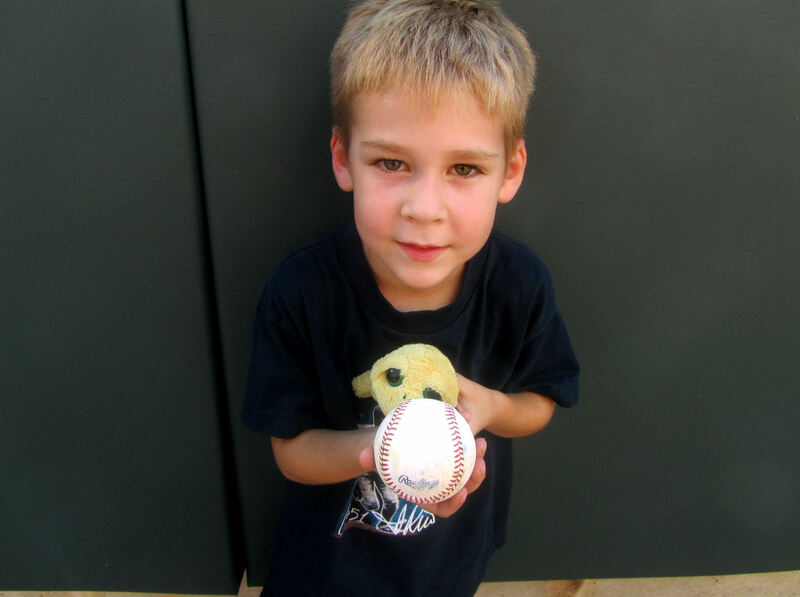 There was still no way I thought it could happen, but in the back of my mind, I thought it would be pretty cool to do it because Tim had gotten his first baseball on September 12, 2006 and his 100th exactly one year earlier on September 12, 2010. How cool would it be to hit 200 on September 12, 2011? Pretty cool, was my thought. But enough with the wild speculations, we had a play area to get to. 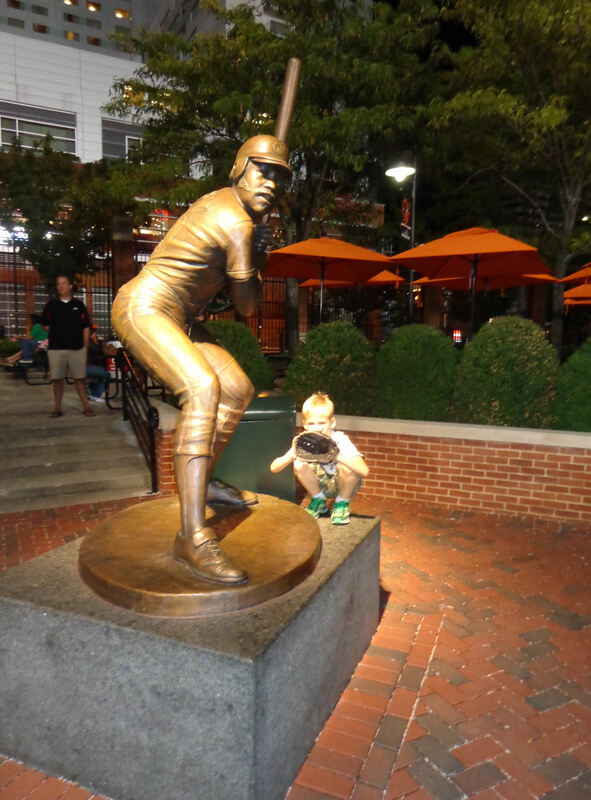 As play areas go, Camden Yards is always a fun one. Lots of things to do and not too crowded to have fun. Actually, that view is from row four of section 10, and our seats were actually about 10-15 feet to the left in row 4 of section 12. Anyway, the seats were awesome, and there was a constant possibility that the ballgirl would catch a foul grounder and give it to Tim. the son of the guy in orange directly in front of Tim in that last picture. But we didn’t stick around in these seats (we need our freedom to move around!) long enough to see if she’d eventually give Tim a foul ball. 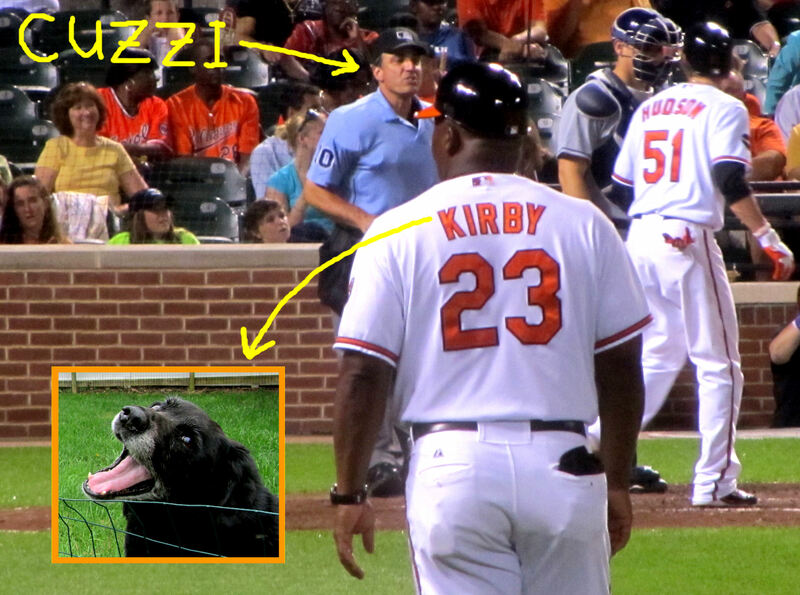 I took it because the Orioles’ first base coach’s last name is “Kirby,” and that is also the name of our awesome black lab (interesting fact: my wife and I met at a dog park thanks to Kirby!). The picture is also interesting because it shows home plate umpire Phil Cuzzi. Cuzzi has given us a post-game baseball once before. Hmm…I wondered if he might do it again. We’ll have to wait and see. The Rays got on the board first in this game. In the top of the third inning, the Rays scored three runs on a 2-RBI double by Ben Zobrist and an RBI single by Sean Rodriguez. We spent a lot of time during the game hanging out by the Rays bullpen. 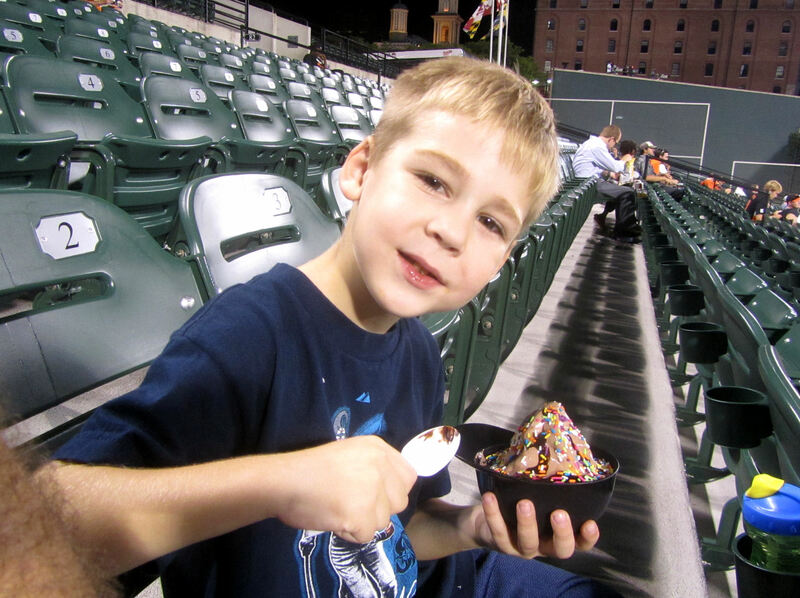 That hyper-crazy look on Tim’s face was induced by a three-pronged attack on his senses – chocolate ice cream, chocolate sprinkles, and chocolate sauce! Only on his MLB anniversary! might have paid off in a big way. In the bottom of the sixth inning (with the O’s trailing 4-1), Orioles catcher Matt Weiters hit a homerun that was hearing almost right to us. But it was a tiny bit to our left (toward centerfield) and not quite far enough to reach us. 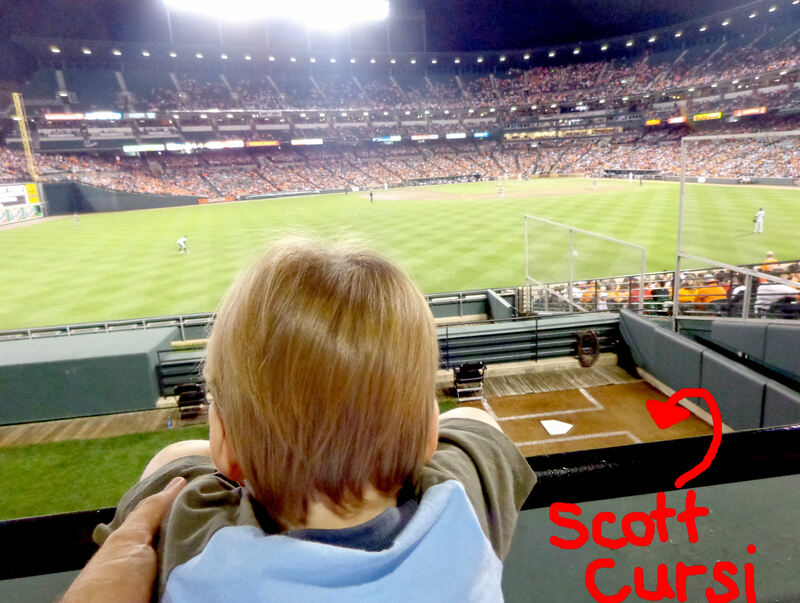 The homerun landed in the Orioles bullpen, bounced over the wall into the Rays bullpen, and right to Scott Cursi. We were literally the closest people to Cursi at the time. I wanted to ask him to toss the homerun ball up to us, but “Scott” just couldn’t get off of my tongue. Before I could recall his name, he rolled the ball back toward the bullpen bench. It rolled past the bullpen and to a police officer stationed at the other side of the bullpen. The cop set the ball down against the back wall of the bullpen for a few seconds. Eventually, one of the players gave him the “it’s okay” sign, and he tossed the homerun ball to a fan above the bullpen. Shucks! 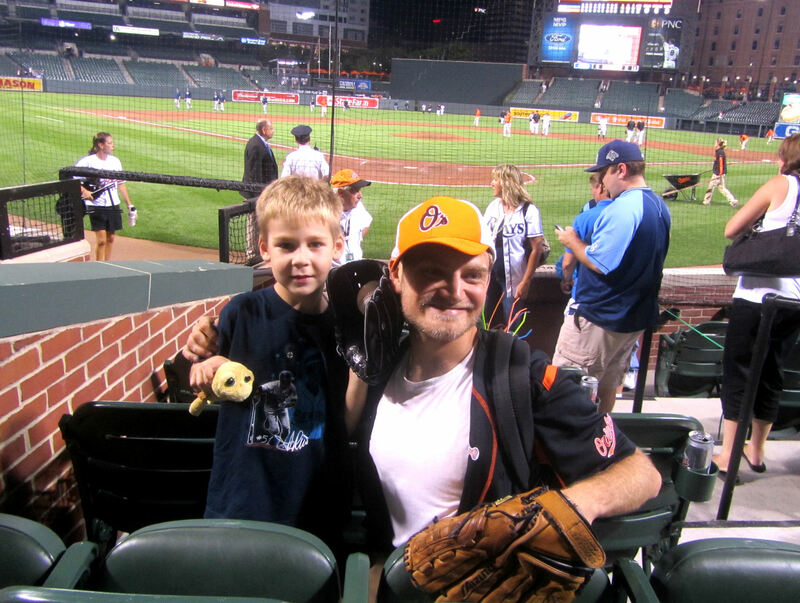 …Avi, Flava Dave (glove on head) and Tim Anderson (Markakis jersey). 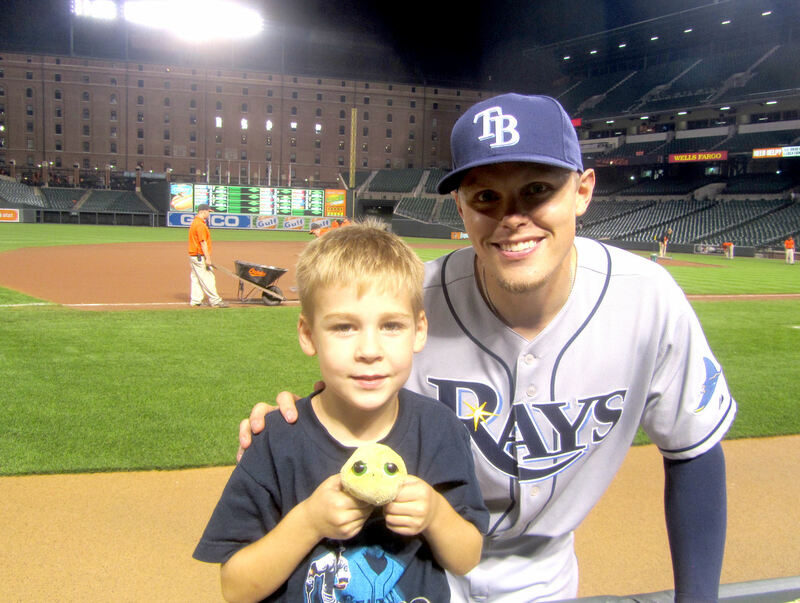 In the picture above, Tim is taking great joy in pointing out the Dora the Explorer backpack in the Rays bullpen. before the end of the game” to reach 200! But it wasn’t looking it was going to happen – and why would it? 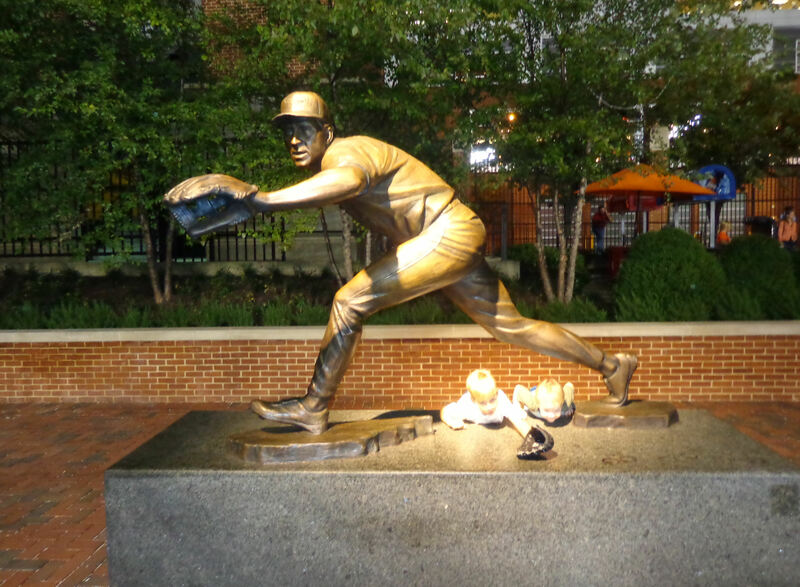 I doubt we have ever got three baseballs after the start of a game before – certainly, we have never gotten three baseballs after the seventh inning stretch. 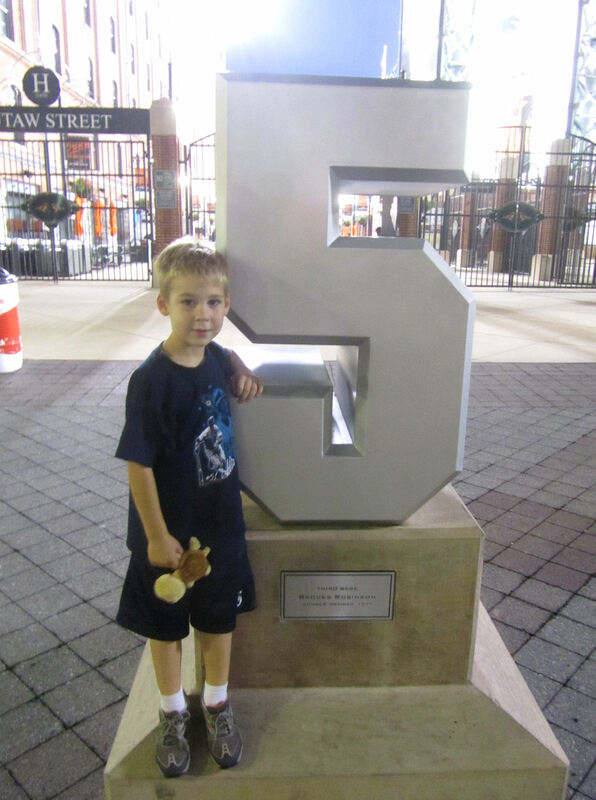 But this was Tim’s Fifth MLB Anniversary! Magic was in the air! equipment bags! 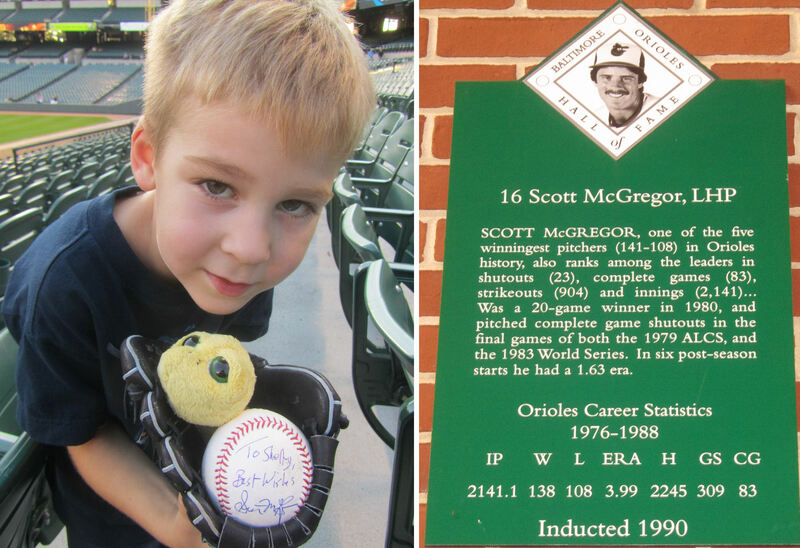 ), pulled out and examined two different baseballs, and then tossed one of them to us. I was super-excited. Could 200 actually happen on Tim’s MLB anniversary? 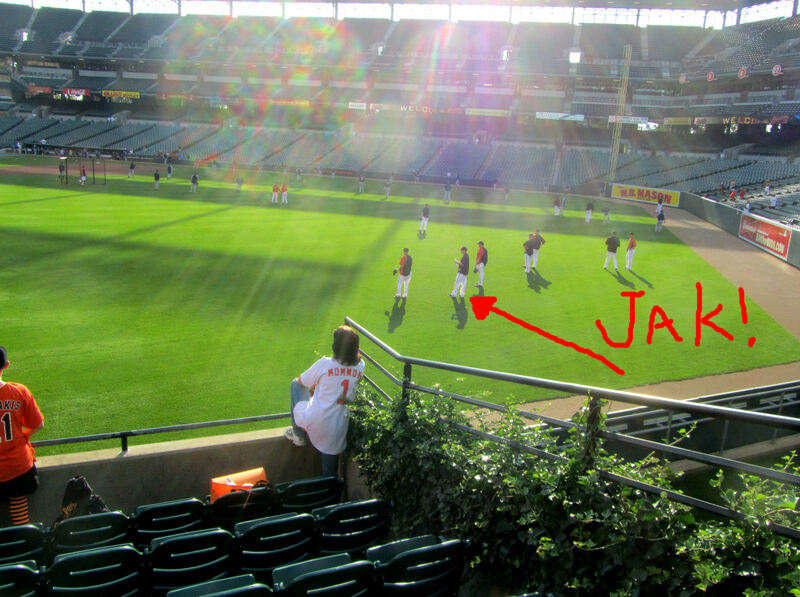 We relocated down by Avi and the guys next to the Orioles bullpen. Avi had seen us get the ball from Cursi. “Just two more!”, I reported! Ronnie took 2-3 almost exaggerated running steps toward the bullpen bench, and then stopped on a dime, spun, and tossed us the baseball over the fence. Holy cow, I thought, this might actually happen! We knew what had to happen. “We’re heading to the umpire’s tunnel, I announced to Avi, Flava Dave, and Mr. Anderson! As the ninth inning progressed, Tim and I chatted with the guy who sits beside the tunnel and punches the buttons that displays the pitch information (speed and kind of pitch). I tried my best, but I failed to correctly decipher a single pitch. …and Phil Cuzzi walked back to the net behind home plate. After the field crew quickly opened the entrance to the tunnel, Cuzzi stayed put. He was waiting for his three colleagues to join him before he exited the field. The mustachioed usher on the other side of the tunnel had brought a little girl down to make an attempt for an umpire ball. But the little girl and Tim were the only kids in sight while Cuzzi waited for the other umpires. I looked around expecting a flock of kids to run to the tunnel. It never happened. As Cuzzi ducked under the net and entered the tunnel walkway, it was just the little girl and Tim who were waiting for him. I could not believe it. Our 200th baseball seemed like a guarantee at this point. First, Cuzzi placed a baseball into the little girl’s hands. Next, he turned around and spotted Tim. 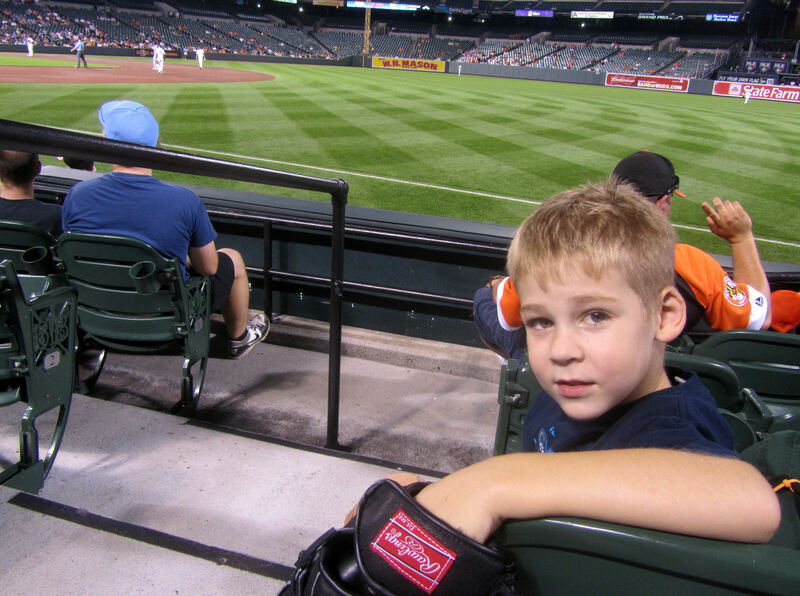 He reached out and placed a beautiful, rubbed up gem of a baseball into Tim’s (actually Kellan’s) baseball glove. Thank you, thank you, thank you, Mr. Cuzzi!!! I truly could not believe it. Aside from the 7-easter egg fluke game in Cleveland, we had never got nine baseballs at a game. It was like the baseball gods were smiling down on Tim trying to make his 5th MLB anniversary as special as possible. 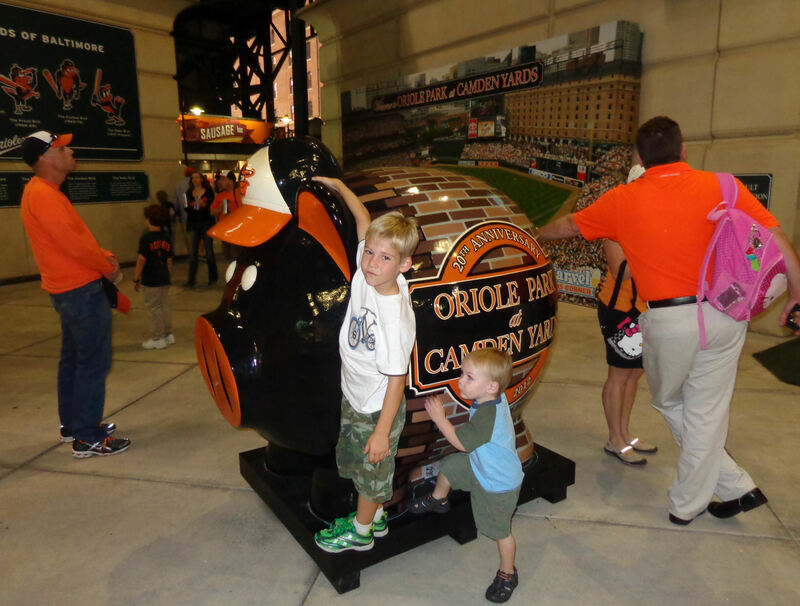 It is always sad when we know we will not visit Camden Yards until the next season. …and then we called it a night. 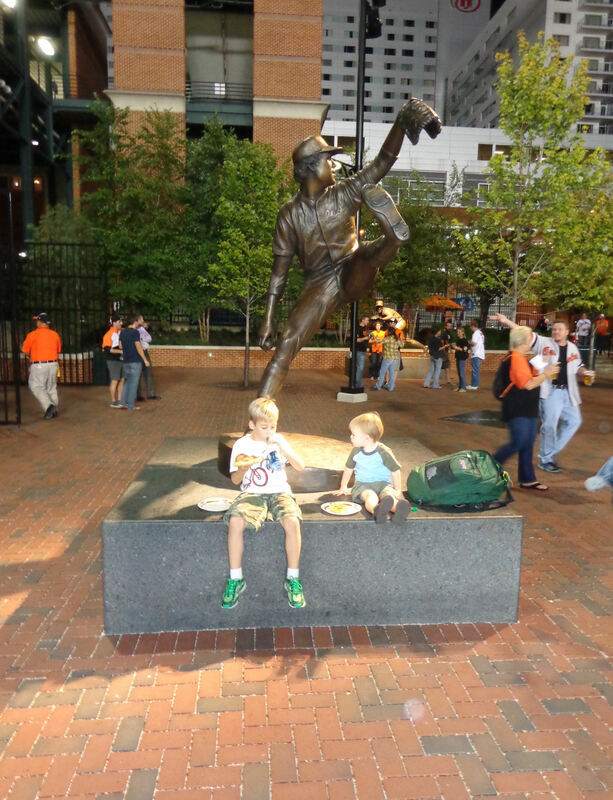 …Fifth MLB Anniversary for Tim. September 12th is quickly becoming one of my very favorite holidays!